The conceptual foundation for DNA nanotechnology was first laid out by Nadrian Seeman in the early 1980s, and the field began to attract widespread interest in the mid-2000s. This use of nucleic acids is enabled by their strict base pairing rules, which cause only portions of strands with complementary base sequences to bind together to form strong, rigid double helix structures. This allows for the rational design of base sequences that will selectively assemble to form complex target structures with precisely controlled nanoscale features. Several assembly methods are used to make these structures, including tile-based structures that assemble from smaller structures, folding structures using the DNA origami method, and dynamically reconfigurable structures using strand displacement methods. While the field's name specifically references DNA, the same principles have been used with other types of nucleic acids as well, leading to the occasional use of the alternative name nucleic acid nanotechnology. Nanostructures of arbitrary, non-regular shapes are usually made using the DNA origami method. These structures consist of a long, natural virus strand as a "scaffold", which is made to fold into the desired shape by computationally designed short "staple" strands. This method has the advantages of being easy to design, as the base sequence is predetermined by the scaffold strand sequence, and not requiring high strand purity and accurate stoichiometry, as most other DNA nanotechnology methods do. DNA origami was first demonstrated for two-dimensional shapes, such as a smiley face and a coarse map of the Western Hemisphere. Solid three-dimensional structures can be made by using parallel DNA helices arranged in a honeycomb pattern, and structures with two-dimensional faces can be made to fold into a hollow overall three-dimensional shape, akin to a cardboard box. These can be programmed to open and reveal or release a molecular cargo in response to a stimulus, making them potentially useful as programmable molecular cages. DNA complexes have been made that change their conformation upon some stimulus, making them one form of nanorobotics. These structures are initially formed in the same way as the static structures made in structural DNA nanotechnology, but are designed so that dynamic reconfiguration is possible after the initial assembly. The earliest such device made use of the transition between the B-DNA and Z-DNA forms to respond to a change in buffer conditions by undergoing a twisting motion. This reliance on buffer conditions, however, caused all devices to change state at the same time. Subsequent systems could change states based upon the presence of control strands, allowing multiple devices to be independently operated in solution. 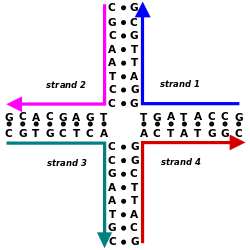 Some examples of such systems are a "molecular tweezers" design that has an open and a closed state, a device that could switch from a paranemic-crossover (PX) conformation to a double-junction (JX2) conformation, undergoing rotational motion in the process, and a two-dimensional array that could dynamically expand and contract in response to control strands. Structures have also been made that dynamically open or close, potentially acting as a molecular cage to release or reveal a functional cargo upon opening. In a study conducted by a group of scientists from iNANO center and CDNA Center in Aarhus university (Aarhus), researchers were able to construct a small multi-switchable 3D DNA Box Origami. The proposed nanoparticle was characterized by atomic force microscopy (AFM), transmission electron microscopy (TEM) and Förster resonance energy transfer (FRET). The constructed box was shown to have a unique reclosing mechanism, which enabled it to repeatedly open and close in response to a unique set of DNA or RNA keys. The authors proposed that this "DNA device can potentially be used for a broad range of applications such as controlling the function of single molecules, controlled drug delivery, and molecular computing.". There are potential applications for DNA nanotechnology in nanomedicine, making use of its ability to perform computation in a biocompatible format to make "smart drugs" for targeted drug delivery. One such system being investigated uses a hollow DNA box containing proteins that induce apoptosis, or cell death, that will only open when in proximity to a cancer cell. There has additionally been interest in expressing these artificial structures in engineered living bacterial cells, most likely using the transcribed RNA for the assembly, although it is unknown whether these complex structures are able to efficiently fold or assemble in the cell's cytoplasm. If successful, this could enable directed evolution of nucleic acid nanostructures. Scientists at Oxford University reported the self-assembly of four short strands of synthetic DNA into a cage which can enter cells and survive for at least 48 hours. The fluorescently labeled DNA tetrahedra were found to remain intact in the laboratory cultured human kidney cells despite the attack by cellular enzymes after two days. This experiment showed the potential of drug delivery inside the living cells using the DNA ‘cage’. A DNA tetrahedron was used to deliver RNA Interference (RNAi) in a mouse model, reported a team of researchers in MIT. Delivery of the interfering RNA for treatment has showed some success using polymer or lipid, but there are limits of safety and imprecise targeting, in addition to short shelf life in the blood stream. The DNA nanostructure created by the team consists of six strands of DNA to form a tetrahedron, with one strand of RNA affixed to each of the six edges. The tetrahedron is further equipped with targeting protein, three folate molecules, which lead the DNA nanoparticles to the abundant folate receptors found on some tumors. The result showed that the gene expression targeted by the RNAi, luciferase, dropped by more than half. This study shows promise in using DNA nanotechnology as an effective tool to deliver treatment using the emerging RNA Interference technology. Nucleic acid design has similar goals to protein design. In both, the sequence of monomers is designed to favor the desired target structure and to disfavor other structures. Nucleic acid design has the advantage of being much computationally easier than protein design, because the simple base pairing rules are sufficient to predict a structure's energetic favorability, and detailed information about the overall three-dimensional folding of the structure is not required. This allows the use of simple heuristic methods that yield experimentally robust designs. However, nucleic acid structures are less versatile than proteins in their function because of proteins' increased ability to fold into complex structures, and the limited chemical diversity of the four nucleotides as compared to the twenty proteinogenic amino acids. In 1991, Seeman's laboratory published a report on the synthesis of a cube made of DNA, the first synthetic three-dimensional nucleic acid nanostructure, for which he received the 1995 Feynman Prize in Nanotechnology. This was followed by a DNA truncated octahedron. However, it soon became clear that these structures, polygonal shapes with flexible junctions as their vertices, were not rigid enough to form extended three-dimensional lattices. Seeman developed the more rigid double-crossover (DX) structural motif, and in 1998, in collaboration with Erik Winfree, published the creation of two-dimensional lattices of DX tiles. These tile-based structures had the advantage that they provided the ability to implement DNA computing, which was demonstrated by Winfree and Paul Rothemund in their 2004 paper on the algorithmic self-assembly of a Sierpinski gasket structure, and for which they shared the 2006 Feynman Prize in Nanotechnology. Winfree's key insight was that the DX tiles could be used as Wang tiles, meaning that their assembly could perform computation. The synthesis of a three-dimensional lattice was finally published by Seeman in 2009, nearly thirty years after he had set out to achieve it. DNA nanotechnology was initially met with some skepticism due to the unusual non-biological use of nucleic acids as materials for building structures and doing computation, and the preponderance of proof of principle experiments that extended the abilities of the field but were far from actual applications. Seeman's 1991 paper on the synthesis of the DNA cube was rejected by the journal Science after one reviewer praised its originality while another criticized it for its lack of biological relevance. By the early 2010s, however, the field was considered to have increased its abilities to the point that applications for basic science research were beginning to be realized, and practical applications in medicine and other fields were beginning to be considered feasible. The field had grown from very few active laboratories in 2001 to at least 60 in 2010, which increased the talent pool and thus the number of scientific advances in the field during that decade. 1 2 DNA polyhedra: Goodman, Russel P.; Schaap, Iwan A. T.; Tardin, C. F.; Erben, Christof M.; Berry, Richard M.; Schmidt, C.F. ; Turberfield, Andrew J. (9 December 2005). "Rapid chiral assembly of rigid DNA building blocks for molecular nanofabrication". Science. 310 (5754): 1661–1665. Bibcode:2005Sci...310.1661G. doi:10.1126/science.1120367. PMID 16339440. 1 2 3 Overview: Mao, Chengde (December 2004). "The emergence of complexity: lessons from DNA". PLoS Biology. 2 (12): 2036–2038. doi:10.1371/journal.pbio.0020431. PMC 535573 . PMID 15597116. 1 2 3 4 5 Overview: Seeman, Nadrian C. (June 2004). "Nanotechnology and the double helix". Scientific American. 290 (6): 64–75. doi:10.1038/scientificamerican0604-64. PMID 15195395. ↑ Background: Pelesko, John A. (2007). Self-assembly: the science of things that put themselves together. New York: Chapman & Hall/CRC. pp. 5, 7. ISBN 978-1-58488-687-7. 1 2 3 4 5 Overview: Seeman, Nadrian C. (2010). "Nanomaterials based on DNA". Annual Review of Biochemistry. 79: 65–87. doi:10.1146/annurev-biochem-060308-102244. PMC 3454582 . PMID 20222824. ↑ Background: Long, Eric C. (1996). "Fundamentals of nucleic acids". In Hecht, Sidney M. Bioorganic chemistry: nucleic acids. New York: Oxford University Press. pp. 4–10. ISBN 0-19-508467-5. ↑ RNA nanotechnology: Chworos, Arkadiusz; Severcan, Isil; Koyfman, Alexey Y.; Weinkam, Patrick; Oroudjev, Emin; Hansma, Helen G.; Jaeger, Luc (2004). "Building Programmable Jigsaw Puzzles with RNA". Science. 306 (5704): 2068–2072. Bibcode:2004Sci...306.2068C. doi:10.1126/science.1104686. PMID 15604402. ↑ RNA nanotechnology: Guo, Peixuan (2010). "The Emerging Field of RNA Nanotechnology". Nature Nanotechnology. 5 (12): 833–842. Bibcode:2010NatNa...5..833G. doi:10.1038/nnano.2010.231. PMC 3149862 . PMID 21102465. 1 2 3 4 Dynamic DNA nanotechnology: Zhang, D. Y.; Seelig, G. (February 2011). "Dynamic DNA nanotechnology using strand-displacement reactions". Nature Chemistry. 3 (2): 103–113. Bibcode:2011NatCh...3..103Z. doi:10.1038/nchem.957. PMID 21258382. 1 2 3 4 5 Structural DNA nanotechnology: Seeman, Nadrian C. (November 2007). "An overview of structural DNA nanotechnology". Molecular Biotechnology. 37 (3): 246–257. doi:10.1007/s12033-007-0059-4. PMC 3479651 . PMID 17952671. ↑ Dynamic DNA nanotechnology: Lu, Y.; Liu, J. (December 2006). "Functional DNA nanotechnology: Emerging applications of DNAzymes and aptamers". Current Opinion in Biotechnology. 17 (6): 580–588. doi:10.1016/j.copbio.2006.10.004. PMID 17056247. ↑ Other arrays: Strong, Michael (March 2004). "Protein Nanomachines". PLoS Biology. 2 (3): e73. doi:10.1371/journal.pbio.0020073. PMC 368168 . PMID 15024422. ↑ Yan, H.; Park, S. H.; Finkelstein, G.; Reif, J. H.; Labean, T. H. (26 September 2003). "DNA-templated self-assembly of protein arrays and highly conductive nanowires". Science. 301 (5641): 1882–1884. Bibcode:2003Sci...301.1882Y. doi:10.1126/science.1089389. PMID 14512621. 1 2 Algorithmic self-assembly: Rothemund, Paul W. K.; Papadakis, Nick; Winfree, Erik (December 2004). 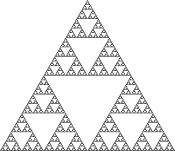 "Algorithmic self-assembly of DNA Sierpinski triangles". PLoS Biology. 2 (12): 2041–2053. doi:10.1371/journal.pbio.0020424. PMC 534809 . PMID 15583715. ↑ DX arrays: Winfree, Erik; Liu, Furong; Wenzler, Lisa A.; Seeman, Nadrian C. (6 August 1998). "Design and self-assembly of two-dimensional DNA crystals". Nature. 394 (6693): 529–544. Bibcode:1998Natur.394..539W. doi:10.1038/28998. PMID 9707114. ↑ DX arrays: Liu, Furong; Sha, Ruojie; Seeman, Nadrian C. (10 February 1999). "Modifying the surface features of two-dimensional DNA crystals". Journal of the American Chemical Society. 121 (5): 917–922. doi:10.1021/ja982824a. ↑ Other arrays: Mao, Chengde; Sun, Weiqiong; Seeman, Nadrian C. (16 June 1999). 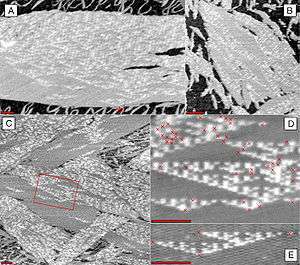 "Designed two-dimensional DNA Holliday junction arrays visualized by atomic force microscopy". Journal of the American Chemical Society. 121 (23): 5437–5443. doi:10.1021/ja9900398. ↑ Other arrays: Mathieu, Frederick; Liao, Shiping; Kopatsch, Jens; Wang, Tong; Mao, Chengde; Seeman, Nadrian C. (April 2005). "Six-helix bundles designed from DNA". Nano Letters. 5 (4): 661–665. Bibcode:2005NanoL...5..661M. doi:10.1021/nl050084f. PMC 3464188 . PMID 15826105. 1 2 3 History: Seeman, Nadrian (9 June 2010). "Structural DNA nanotechnology: growing along with Nano Letters". Nano Letters. 10 (6): 1971–1978. Bibcode:2010NanoL..10.1971S. doi:10.1021/nl101262u. PMC 2901229 . PMID 20486672. ↑ Algorithmic self-assembly: Barish, Robert D.; Rothemund, Paul W. K.; Winfree, Erik (December 2005). "Two computational primitives for algorithmic self-assembly: copying and counting". Nano Letters. 5 (12): 2586–2592. Bibcode:2005NanoL...5.2586B. doi:10.1021/nl052038l. PMID 16351220. 1 2 3 4 Design: Feldkamp, U.; Niemeyer, C. M. (13 March 2006). "Rational design of DNA nanoarchitectures". Angewandte Chemie International Edition. 45 (12): 1856–1876. doi:10.1002/anie.200502358. PMID 16470892. ↑ DNA nanotubes: Yin, P.; Hariadi, R. F.; Sahu, S.; Choi, H. M. T.; Park, S. H.; Labean, T. H.; Reif, J. H. (8 August 2008). "Programming DNA Tube Circumferences". Science. 321 (5890): 824–826. Bibcode:2008Sci...321..824Y. doi:10.1126/science.1157312. PMID 18687961. ↑ Three-dimensional arrays: Zheng, Jianping; Birktoft, Jens J.; Chen, Yi; Wang, Tong; Sha, Ruojie; Constantinou, Pamela E.; Ginell, Stephan L.; Mao, Chengde; Seeman, Nadrian C. (3 September 2009). "From molecular to macroscopic via the rational design of a self-assembled 3D DNA crystal". Nature. 461 (7260): 74–77. Bibcode:2009Natur.461...74Z. doi:10.1038/nature08274. PMC 2764300 . PMID 19727196. 1 2 3 4 5 6 7 8 9 Overview: Pinheiro, A. V.; Han, D.; Shih, W. M.; Yan, H. (December 2011). "Challenges and opportunities for structural DNA nanotechnology". Nature Nanotechnology. 6 (12): 763–772. Bibcode:2011NatNa...6..763P. doi:10.1038/nnano.2011.187. PMC 3334823 . PMID 22056726. ↑ DNA polyhedra: Zhang, Yuwen; Seeman, Nadrian C. (1 March 1994). "Construction of a DNA-truncated octahedron". Journal of the American Chemical Society. 116 (5): 1661–1669. doi:10.1021/ja00084a006. ↑ DNA polyhedra: Shih, William M.; Quispe, Joel D.; Joyce, Gerald F. (12 February 2004). "A 1.7-kilobase single-stranded DNA that folds into a nanoscale octahedron". Nature. 427 (6975): 618–621. Bibcode:2004Natur.427..618S. doi:10.1038/nature02307. PMID 14961116. 1 2 3 DNA origami: Rothemund, Paul W. K. (16 March 2006). "Folding DNA to create nanoscale shapes and patterns". Nature. 440 (7082): 297–302. Bibcode:2006Natur.440..297R. doi:10.1038/nature04586. PMID 16541064. 1 2 DNA origami: Douglas, Shawn M.; Dietz, Hendrik; Liedl, Tim; Högberg, Björn; Graf, Franziska; Shih, William M. (21 May 2009). "Self-assembly of DNA into nanoscale three-dimensional shapes". Nature. 459 (7245): 414–418. Bibcode:2009Natur.459..414D. doi:10.1038/nature08016. PMC 2688462 . PMID 19458720. 1 2 DNA boxes: Andersen, Ebbe S.; Dong, Mingdong; Nielsen, Morten M.; Jahn, Kasper; Subramani, Ramesh; Mamdouh, Wael; Golas, Monika M.; Sander, Bjoern; et al. (7 May 2009). "Self-assembly of a nanoscale DNA box with a controllable lid". Nature. 459 (7243): 73–76. Bibcode:2009Natur.459...73A. doi:10.1038/nature07971. PMID 19424153. ↑ DNA boxes: Ke, Yonggang; Sharma, Jaswinder; Liu, Minghui; Jahn, Kasper; Liu, Yan; Yan, Hao (10 June 2009). "Scaffolded DNA origami of a DNA tetrahedron molecular container". Nano Letters. 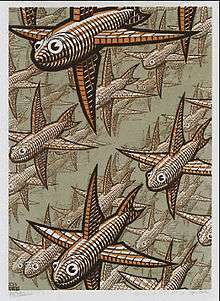 9 (6): 2445–2447. Bibcode:2009NanoL...9.2445K. doi:10.1021/nl901165f. PMID 19419184. ↑ Overview: Endo, M.; Sugiyama, H. (12 October 2009). "Chemical approaches to DNA nanotechnology". ChemBioChem. 10 (15): 2420–2443. doi:10.1002/cbic.200900286. PMID 19714700. ↑ Nanoarchitecture: Zheng, Jiwen; Constantinou, Pamela E.; Micheel, Christine; Alivisatos, A. Paul; Kiehl, Richard A.; Seeman Nadrian C. (July 2006). 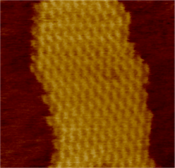 "2D Nanoparticle Arrays Show the Organizational Power of Robust DNA Motifs". Nano Letters. 6 (7): 1502–1504. Bibcode:2006NanoL...6.1502Z. doi:10.1021/nl060994c. PMC 3465979 . PMID 16834438. ↑ Nanoarchitecture: Cohen, Justin D.; Sadowski, John P.; Dervan, Peter B. (22 October 2007). "Addressing single molecules on DNA nanostructures". Angewandte Chemie International Edition. 46 (42): 7956–7959. doi:10.1002/anie.200702767. PMID 17763481. ↑ Nanoarchitecture: Maune, Hareem T.; Han, Si-Ping; Barish, Robert D.; Bockrath, Marc; Goddard III, William A.; Rothemund, Paul W. K.; Winfree, Erik (January 2009). "Self-assembly of carbon nanotubes into two-dimensional geometries using DNA origami templates". Nature Nanotechnology. 5 (1): 61–66. Bibcode:2010NatNa...5...61M. doi:10.1038/nnano.2009.311. PMID 19898497. ↑ Nanoarchitecture: Liu, J.; Geng, Y.; Pound, E.; Gyawali, S.; Ashton, J. R.; Hickey, J.; Woolley, A. T.; Harb, J. N. (22 March 2011). "Metallization of branched DNA origami for nanoelectronic circuit fabrication". ACS Nano. 5 (3): 2240–2247. doi:10.1021/nn1035075. PMID 21323323. ↑ Nanoarchitecture: Deng, Z.; Mao, C. (6 August 2004). "Molecular lithography with DNA nanostructures". Angewandte Chemie International Edition. 43 (31): 4068–4070. doi:10.1002/anie.200460257. 1 2 3 4 DNA machines: Bath, Jonathan; Turberfield, Andrew J. (May 2007). "DNA nanomachines". Nature Nanotechnology. 2 (5): 275–284. Bibcode:2007NatNa...2..275B. doi:10.1038/nnano.2007.104. PMID 18654284. ↑ DNA machines: Mao, Chengde; Sun, Weiqiong; Shen, Zhiyong; Seeman, Nadrian C. (14 January 1999). "A DNA nanomechanical device based on the B-Z transition". Nature. 397 (6715): 144–146. Bibcode:1999Natur.397..144M. doi:10.1038/16437. PMID 9923675. ↑ DNA machines: Yan, Hao; Zhang, Xiaoping; Shen, Zhiyong; Seeman, Nadrian C. (3 January 2002). "A robust DNA mechanical device controlled by hybridization topology". Nature. 415 (6867): 62–65. Bibcode:2002Natur.415...62Y. doi:10.1038/415062a. PMID 11780115. ↑ DNA machines: Feng, L.; Park, S. H.; Reif, J. H.; Yan, H. (22 September 2003). "A two-state DNA lattice switched by DNA nanoactuator". Angewandte Chemie. 115 (36): 4478–4482. doi:10.1002/ange.200351818. ↑ DNA machines: Goodman, R. P.; Heilemann, M.; Doose, S. R.; Erben, C. M.; Kapanidis, A. N.; Turberfield, A. J. (February 2008). "Reconfigurable, braced, three-dimensional DNA nanostructures". Nature Nanotechnology. 3 (2): 93–96. Bibcode:2008NatNa...3...93G. doi:10.1038/nnano.2008.3. PMID 18654468. ↑ Applications: Douglas, Shawn M.; Bachelet, Ido; Church, George M. (17 February 2012). "A logic-gated nanorobot for targeted transport of molecular payloads". Science. 335 (6070): 831–834. Bibcode:2012Sci...335..831D. doi:10.1126/science.1214081. ↑ DNA walkers: Shin, Jong-Shik; Pierce, Niles A. (8 September 2004). "A synthetic DNA walker for molecular transport". Journal of the American Chemical Society. 126 (35): 10834–10835. doi:10.1021/ja047543j. PMID 15339155. ↑ DNA walkers: Sherman, William B.; Seeman, Nadrian C. (July 2004). "A precisely controlled DNA biped walking device". Nano Letters. 4 (7): 1203–1207. Bibcode:2004NanoL...4.1203S. doi:10.1021/nl049527q. ↑ DNA walkers: Tian, Ye; He, Yu; Chen, Yi; Yin, Peng; Mao, Chengde (11 July 2005). "A DNAzyme that walks processively and autonomously along a one-dimensional track". Angewandte Chemie. 117 (28): 4429–4432. doi:10.1002/ange.200500703. ↑ DNA walkers: Bath, Jonathan; Green, Simon J.; Turberfield, Andrew J. (11 July 2005). "A free-running DNA motor powered by a nicking enzyme". Angewandte Chemie International Edition. 44 (28): 4358–4361. doi:10.1002/anie.200501262. ↑ Functional DNA walkers: Lund, Kyle; Manzo, Anthony J.; Dabby, Nadine; Michelotti, Nicole; Johnson-Buck, Alexander; Nangreave, Jeanette; Taylor, Steven; Pei, Renjun; Stojanovic, Milan N.; Walter, Nils G.; Winfree, Erik; Yan, Hao (13 May 2010). "Molecular robots guided by prescriptive landscapes". Nature. 465 (7295): 206–210. Bibcode:2010Natur.465..206L. doi:10.1038/nature09012. PMC 2907518 . PMID 20463735. ↑ Functional DNA walkers: He, Yu; Liu, David R. (November 2010). "Autonomous multistep organic synthesis in a single isothermal solution mediated by a DNA walker". Nature Nanotechnology. 5 (11): 778–782. Bibcode:2010NatNa...5..778H. doi:10.1038/nnano.2010.190. PMC 2974042 . PMID 20935654. ↑ "Recent progress on DNA based walkers". Current Opinion in Biotechnology. 34: 56–64. doi:10.1016/j.copbio.2014.11.017. Retrieved 2015-09-28. 1 2 3 Kinetic assembly: Yin, Peng; Choi, Harry M. T.; Calvert, Colby R.; Pierce, Niles A. (17 January 2008). "Programming biomolecular self-assembly pathways". Nature. 451 (7176): 318–322. Bibcode:2008Natur.451..318Y. doi:10.1038/nature06451. PMID 18202654. ↑ Fuzzy and Boolean logic gates based on DNA: Zadegan, R. M.; Jepsen, M. D. E.; Hildebrandt, L. L.; Birkedal, V.; Kjems, J. R. (2015). "Construction of a Fuzzy and Boolean Logic Gates Based on DNA". Small. 11 (15): 1811–7. doi:10.1002/smll.201402755. PMID 25565140. ↑ Strand displacement cascades: Seelig, G.; Soloveichik, D.; Zhang, D. Y.; Winfree, E. (8 December 2006). "Enzyme-free nucleic acid logic circuits". Science. 314 (5805): 1585–1588. Bibcode:2006Sci...314.1585S. doi:10.1126/science.1132493. PMID 17158324. ↑ Strand displacement cascades: Qian, Lulu; Winfree, Erik (3 June 2011). "Scaling up digital circuit computation with DNA strand displacement cascades". Science. 332 (6034): 1196–1201. Bibcode:2011Sci...332.1196Q. doi:10.1126/science.1200520. PMID 21636773. 1 2 3 4 5 History/applications: Service, Robert F. (3 June 2011). "DNA nanotechnology grows up". Science. 332 (6034): 1140–1143. doi:10.1126/science.332.6034.1140. ↑ Applications: Rietman, Edward A. (2001). Molecular engineering of nanosystems. Springer. pp. 209–212. ISBN 978-0-387-98988-4. Retrieved 17 April 2011. ↑ M. Zadegan, Reza; et, al. (2012). "Construction of a 4 Zeptoliters Switchable 3D DNA Box Origami". ACS Nano. 6 (11): 10050–10053. doi:10.1021/nn303767b. ↑ Applications: Jungmann, Ralf; Renner, Stephan; Simmel, Friedrich C. (March 2008). "From DNA nanotechnology to synthetic biology". HFSP journal. 2 (2): 99–109. doi:10.2976/1.2896331. PMC 2645571 . PMID 19404476. ↑ Lovy, Howard (5 July 2011). "DNA cages can unleash meds inside cells". fiercedrugdelivery.com. Retrieved 22 September 2013. ↑ Walsh, Anthony; Yin, Hai; Erben, Christoph; Wood, Matthew; Turberfield, Andrew (2011). "DNA Cage Delivery to Mammalian Cells". ACS Nano. ACS Publications. 5 (7): 5427–5432. doi:10.1021/nn2005574. PMID 21696187. ↑ Trafton, Anne (4 June 2012). "Researchers achieve RNA interference, in a lighter package". MIT News. Retrieved 22 September 2013. ↑ Lee, Hyukjin; Lytton-Jean, Abigail; Chen, Yi; Love, Kevin; Park, Angela; Karagiannis, Emmanouil; Sehgal, Alfica; Querbes, William; et al. (2012). "Molecularly self-assembled nucleic acid nanoparticles for targeted in vivo siRNA delivery" (PDF). Nature Nanotechnology. Nature. 7 (6): 389–393. Bibcode:2012NatNa...7..389L. doi:10.1038/NNANO.2012.73. 1 2 3 Design: Brenneman, Arwen; Condon, Anne (25 September 2002). "Strand design for biomolecular computation". Theoretical Computer Science. 287: 39–58. doi:10.1016/S0304-3975(02)00135-4. ↑ Overview: Lin, Chenxiang; Liu, Yan; Rinker, Sherri; Yan, Hao (11 August 2006). "DNA tile based self-assembly: building complex nanoarchitectures". ChemPhysChem. 7 (8): 1641–1647. doi:10.1002/cphc.200600260. PMID 16832805. 1 2 3 Design: Dirks, Robert M.; Lin, Milo; Winfree, Erik; Pierce, Niles A. (15 February 2004). "Paradigms for computational nucleic acid design". Nucleic Acids Research. 32 (4): 1392–1403. doi:10.1093/nar/gkh291. PMC 390280 . PMID 14990744. ↑ Methods: Ellington, A.; Pollard, J. D. (1 May 2001). "Synthesis and purification of oligonucleotides". Current Protocols in Molecular Biology. doi:10.1002/0471142727.mb0211s42. ISBN 0471142727. ↑ Methods: Ellington, A.; Pollard, J. D. (1 May 2001). "Purification of oligonucleotides using denaturing polyacrylamide gel electrophoresis". Current Protocols in Molecular Biology. doi:10.1002/0471142727.mb0212s42. ISBN 0471142727. ↑ Methods: Gallagher, S. R.; Desjardins, P. (1 July 2011). "Quantitation of nucleic acids and proteins". Current Protocols Essential Laboratory Techniques. doi:10.1002/9780470089941.et0202s5. ISBN 0470089938. ↑ Methods: Chory, J.; Pollard, J. D. (1 May 2001). "Separation of small DNA fragments by conventional gel electrophoresis". Current Protocols in Molecular Biology. doi:10.1002/0471142727.mb0207s47. ISBN 0471142727. ↑ Methods: Walter, N. G. (1 February 2003). "Probing RNA structural dynamics and function by fluorescence resonance energy transfer (FRET)". Current Protocols in Nucleic Acid Chemistry. doi:10.1002/0471142700.nc1110s11. ISBN 0471142700. 1 2 3 History: Pelesko, John A. (2007). Self-assembly: the science of things that put themselves together. New York: Chapman & Hall/CRC. pp. 201, 242, 259. ISBN 978-1-58488-687-7. ↑ History: See "Current crystallization protocol". Nadrian Seeman Lab. for a statement of the problem, and "DNA cages containing oriented guests". Nadrian Seeman Laboratory. for the proposed solution. 1 2 DNA origami: Rothemund, Paul W. K. (2006). 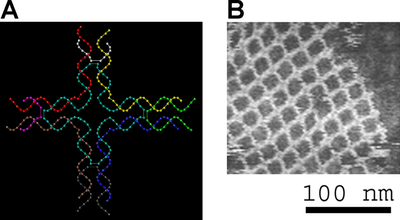 "Scaffolded DNA origami: from generalized multicrossovers to polygonal networks". In Chen, Junghuei; Jonoska, Natasha; Rozenberg, Grzegorz. Nanotechnology: science and computation. Natural Computing Series. New York: Springer. pp. 3–21. doi:10.1007/3-540-30296-4_1. ISBN 978-3-540-30295-7. ↑ Nanoarchitecture: Robinson, Bruche H.; Seeman, Nadrian C. (August 1987). "The design of a biochip: a self-assembling molecular-scale memory device". Protein Engineering. 1 (4): 295–300. doi:10.1093/protein/1.4.295. PMID 3508280. ↑ Nanoarchitecture: Xiao, Shoujun; Liu, Furong; Rosen, Abbey E.; Hainfeld, James F.; Seeman, Nadrian C.; Musier-Forsyth, Karin; Kiehl, Richard A. (August 2002). "Selfassembly of metallic nanoparticle arrays by DNA scaffolding". Journal of Nanoparticle Research. 4 (4): 313–317. doi:10.1023/A:1021145208328. ↑ History: Hopkin, Karen (August 2011). "Profile: 3-D seer". The Scientist. Retrieved 8 August 2011.